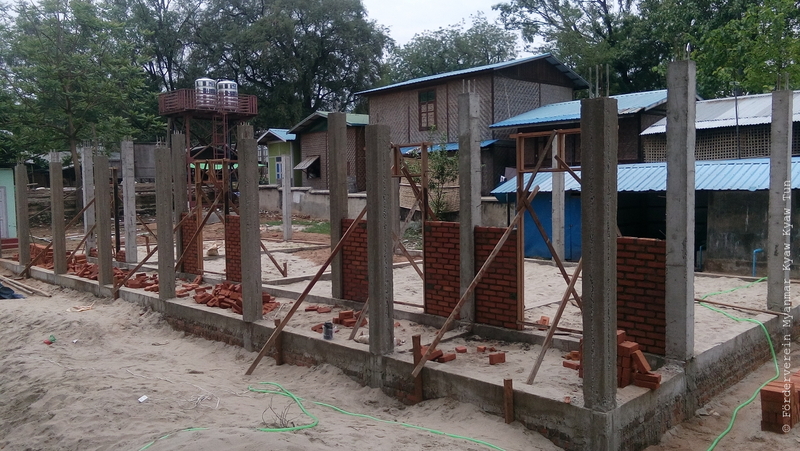 The new primary school will be based on the teaching methods of the nursery school in Mingun and is located in the same grounds. The parents took the initiative to join together because they had seen that their children were better skilled and seemed much more lively than the children who did not have this experience. So they decided that the new teaching methods should be used in the new primary school, too. For three years now the children have been learning and playing with the various methods of free and independent working, well-ordered playing and singing, movement education and gardening. The children will be taught to read, write and do sums with teaching methods suitable for children. They will be playfully instructed in general knowledge and geography and at the same time they will be learning the English language. These primary school teaching methods are supported by German experts, so “rote-learning: the teacher is reciting and the whole class must repeat several times” is no longer practised. It means that the children are instructed to learn in methods according to their age and psychological development. Beginning on 1st June teaching will start in one class and will be expanded gradually to four classes. Later there will be sanitary installations such as toilets and showers in the primary school as well as in the nursery school. In the academic year 2017/18 the teaching will be done by two teachers, two young ladies who were trained in the NTTC. The sponsorship is guaranteed by an abbot, while the “Förderverein” will have responsibility for the didactic and educational leadership as well as, for the time being, for the salary of the teachers. We need to find sponsorships, so all kinds of donations are warmly welcome. You can become godparents of children, but you can also give a donation for educational materials or a food allowance for the children.